The sun peeks out behind the clouds in the small island town of Put-In-Bay. Flowers start to bloom, birds once again fill the air with their springtime songs, and long lost friends embark upon their journey back to their favorite Lake Erie island. The sleepy town awakens from its winter hibernation to welcome a new season of fun, music, tourists, and boating. But the season hasn’t officially started until the famous Whiskey Light is re-lit. Come with me as Taking On Columbus revisits my favorite little island and takes on Whiskey Light! I have previously written about the small town of Put-In-Bay on South Bass Island (click here for the full article) but I couldn’t resist focusing on one of the most celebrated island events; Whiskey Light. The bi-annual celebration is a historic tradition for the Round House Bar on Put-In-Bay! Tourists and Regulars from all over come to celebrate the opening or closing of another tourist season. “An 1888 article names one of the first owners as George F. Schmidt (or Smith). Legend has it that G.F. was known as “Round House” Smith…or maybe because the bar was round, he was named “Round House Smith”. Either way, the name was changed and Round House continued to be the island staple it is today providing ice cold buckets of beer, salted peanuts, and some of the most entertaining bands on the island. I had the pleasure of talking with long-time local and island entertainer/ Reel Bar Co-Owner Ray Fogg about the historical significance of Whiskey Light. Each April and October the Whiskey Light Celebration is held. It symbolizes the beginning or ending of the tourist season for the entire island. 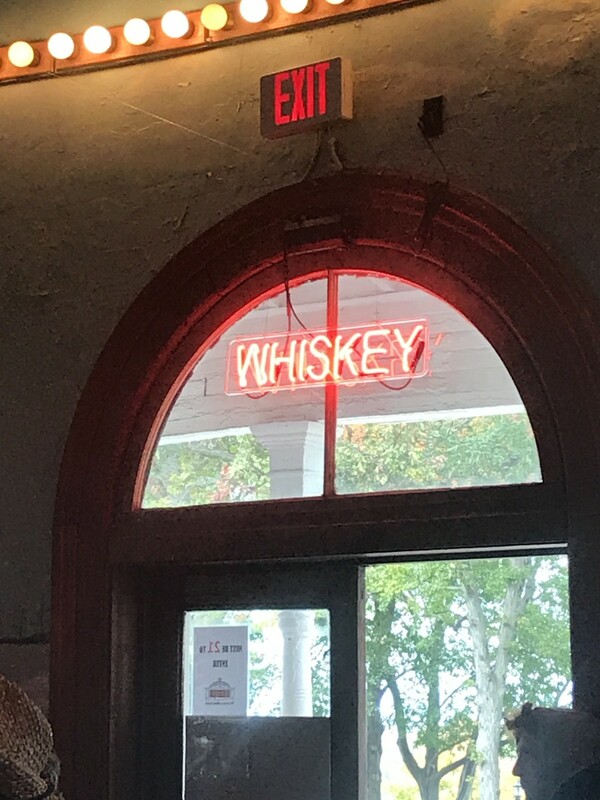 Over the front door of The Round House is a half-moon window with a bright red neon light that reads “Whiskey.” This is the infamous Whiskey Light that is turned on or off to commemorate the start or end of the tourist season. Legend has it; the neon light was used as a signal to weary boaters in the harbor that the bar was finally open. The first public Whiskey Light Celebration was in April of 1997. Before then, only a small private party would be held for locals. In the Fall of 1996 Ray Fogg wrote a song to celebrate the tradition of Whiskey Light called; Look For The Whiskey Light. Ray played it at the first public celebration and it was an instant hit! Now between 400 and 500 people attend the celebration each year and they all look forward to Ray playing Look For The Whiskey Light. Many Islanders and regulars look forward to the Whiskey Light Celebration as a time to see friends that they haven’t seen all winter, say goodbye to friends that they won’t see until next year, and of course celebrate the best time of the year; tourist season! Whiskey Light is something every island lover must experience at least once!